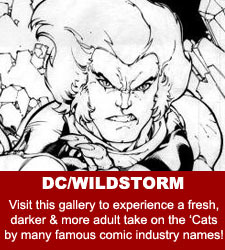 Welcome to the ThunderCats Lair Original Comic Art Gallery! 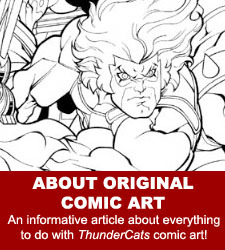 Here you will find original pages of artwork that were used to create a variety of different ThunderCats comics, dating from the 1980s to the present day and encompassing artwork from Marvel US, Marvel UK and DC/Wildstorm. For more information about these beautiful art pieces, we recommend you visit our page, linked to below, “About ThunderCats Original Comic Art”, which contains a list of frequently asked questions and a variety of information that you may or may not know about original comic art! 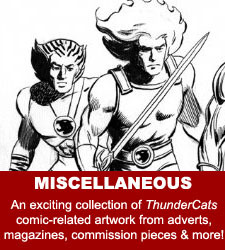 We currently have hosted well over 100 pages of original ThunderCats comic art – some of these pieces are owned by ThunderCats Lair team members but most have been generously donated by comic art collectors and dealers, ThunderCats fans, and even the artists themselves! To make this section as easy to navigate as possible, we have divided the artwork up into four sections, one for each of the main comic series and a section for any miscellaneous artwork such as promotional pieces. Click on the images below to take you to each section! 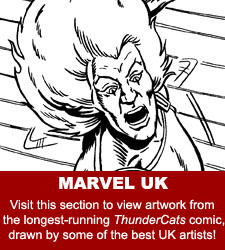 Here at ThunderCats Lair, we realise that original comic art can change owners, often faster than we can keep up with! If you have any comments or corrections regarding the credits for these production pieces, please don’t hesitate to contact grizzlor@thundercatslair.org. 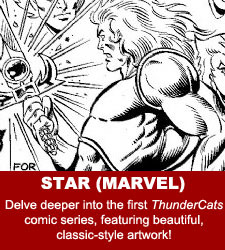 Our aim is to make this one of the largest collections of ThunderCats original comic art on the Internet – if you have any pieces in your collection that you would like to see us showcase, needless to say we would love to hear from you!